A Teaching Atelier in the Heart of Florence. 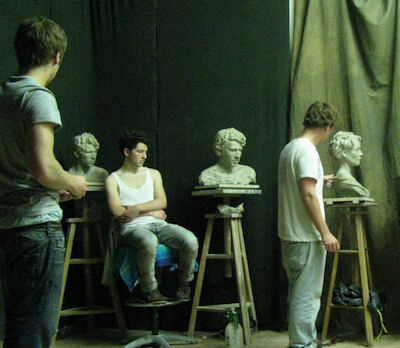 Jason Arkles' teaching studio, the Studio Della Statua, offers private and semiprivate instruction in most aspects of traditional and figurative sculpture production. Unlike other art schools, the Studio doesn't have set semesters or terms - a student may join at any time, and the curriculum for each student is tailor-made to their needs and interests. Part-time, full-time, independent study, and evening workshops are offered year-round. Whether you are a beginner or advanced student, a working professional, or an art student enrolled in an institution in Florence looking for supplemental courses, the Studio Della Statua can meet your needs. Additionally, Jason Arkles teaches outside of Florence in studios and schools around the world - click here to see if there is a workshop coming soon to a studio near you!